Two years after a launch accident (er, "unscheduled disassembly") at Wallops VA, the return to flight is finally here. There is an ISS resupply launch tonight just after dark at 8:03 PM EDT. Weather at the moment looks good. Should be visible for much of the mid-atlantic US east coast. More info here, and there should be various live streams of the launch online. Look to the SE. It will be at low elevation, so look for a spot with a low horizon. A fist held at arm's length subtends about 10 degrees. Depending on your location, it should be visible about 30s after launch. Use this OA-5_Viewing.kmz file in Google Earth to simulate the view from your location. 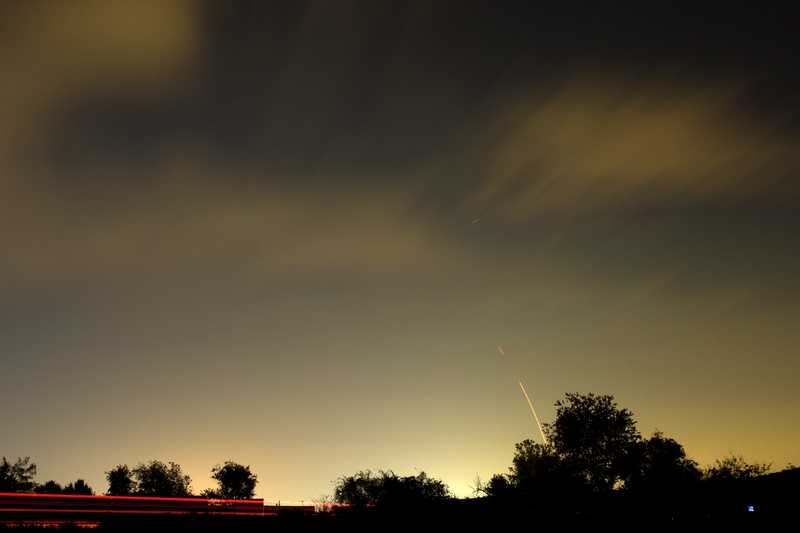 Here's a composite of several 20s exposures of a Wallops launch as seen from north of Baltimore in 2013. 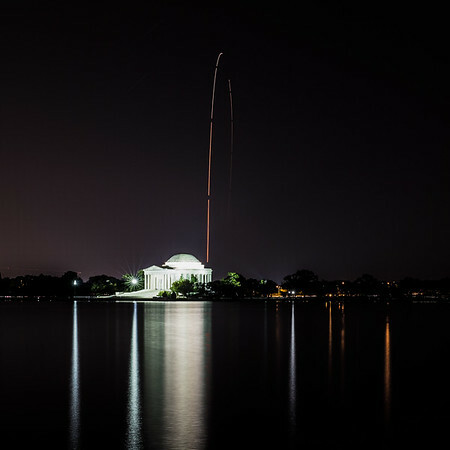 Ken has a really nice photo of this launch from D.C. The actual rocket plume will look like a bright, possibly flickering, moving dot. You might also be able to see the first stage burnout and coast, followed by the second stage ignition. Looks like the countdown is underway today. You can listen to the checklists being worked on this Wallops live feed, or here at Spaceflight Now (with some text updates). NASA TV should pick up coverage at 6:45 PM EDT. Nominal launch time is now 7:40:40 PM EDT with a 5 min window. Depending on where you are, expect it to appear above your horizon ~30-60s after launch. This will be the first Antares launch with the new RD-181 engines replacing the 1970's built refurb AJ-26 engines which were implicated in the failure 2 years ago. More details here. Looks like they are still "go" for launch in 30 mins. It's on the way. Couldn't see anything from here but we're watching the video feed. We got a great look from our rooftop in DC. Thanks for the tip, Eddie! Do you know how long it will take it to reach the ISS? It normally takes 1-2 days to reach the station, but in this case they are going to loiter some distance away until Sunday so that a manned Soyuz launch on Wed can dock at the ISS first (on Friday). I think this is a safety issue rather than a docking logistics issue. Had Cygnus launched on time Sunday rather than Monday it would have gone directly to the station before the Soyuz. 11x 30s stacked... I didn't expect the gaps to be so long, I guess I need to try for a single exposure next time. My wife was there. At Wallops. Awesome shot, Ken! I kindof like the regular gaps because it timetags the trace, but it does distract a little. A single 5min exposure would have saturated Jefferson though. You could stop it down or reduce the gain, but then run the risk of not seeing the fainter part of the trace. I'm always amazed at how bright the plume is though. Can even see the reflection of it in part of your photo. I tried a test exposure at f/7 but the cloudy sky saturated in 4 mins, so I backed off to f/10 which left headroom for the trace on top of the sky. A filter might help. Seems like it should be able to buffer regular exposures as fast as it does in "sports mode" to get that high frame rate. The gaps in your photo appear to be about 1.5s long. I was shooting RAW, dunno if that matters for frame rate. Can you lock the mirror up across multiple exps? There isn't some sort of high dynamic range (HDR) software for post-processing image streams like this?